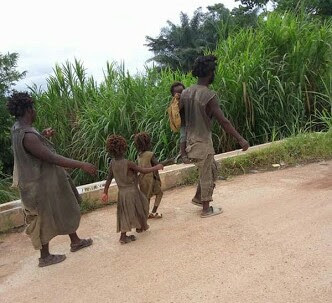 A Nigerian lady identified as Progress took to Facebook to share the shocking story of a family consisting of husband, wife, and three beautiful children plagued with insanity in Ogoja area of Cross River State. "This happens to be the weirdest situation I've seen in my entire life. I have been trying to get this shot for the past five months and whenever I tried, they either walk past too quickly, change direction, or not just close enough. I have seen them trekking long distances underthe scorching sun, I've also met them in the market making enquiries about where they could get a particular item to buy. They're never separated, always found walking together, complete family. But the intriguing part is their communication. Jeez! This "MAD" family speak CORRECT QUEENS ENGLISH. They flow in CLEAN grammar. Na this one dey burst my head. At the market he asked someone for directions and he went; "Hey ma'am, Pls where can I get this and this." A conversation ensued between him and his wife one day and it turned into an argument, people were listening; you'll be so shocked when you hear what the content of their argument was."